The Pro FootFidget® was designed by Physical Therapists for Physical and Occupational therapists to use in the clinic or home programs. The Total Body Exerciser comes with its own sturdy light weight metal stand with 3 adjustable heights, and 3 sets of varied resistance bands. 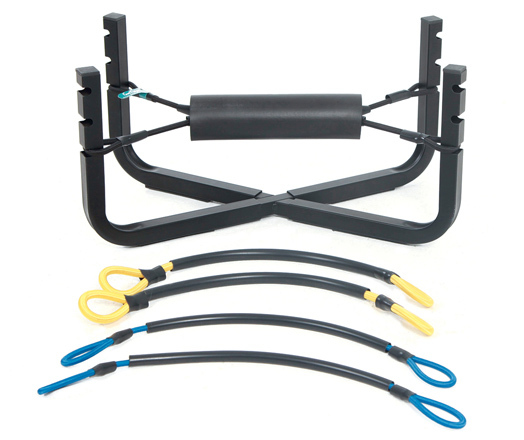 The 3 sets of bands can be used singularly or in any combination to provide the exact amount of resistance needed for use as a Total Body Exerciser in any position. This device is very light, portable, and height adjustable. Included is a page of exercise examples – lower and upper extremity, core exercises, and balancing activities to get you started. We deliver only within the Continental United States. Please contact us at info@footfidget.com for a listing of our distributors who will deliver to your country.